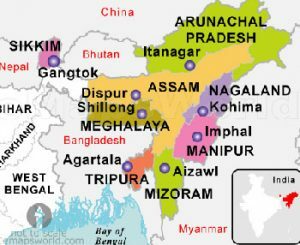 Manipur is one of the Eight Sister States, as they are called, of India’s northeastern region, to a large extent landlocked and isolated from the rest of India having Bangladesh lying inbetween. In particular the easternmost states, Arunachal Pradesh, Nagaland, Manipur, Tripura and Mizoram have also had restrictions in force making it difficult for outsiders to go there without special permissions. However, the new Indian government under Prime Minister Narendra Modi, has eased these restrictions for almost all the northeastern states. Statue of Freedom at campus. In memory of Maharaja Gambhir Singh‘s victory in the Seven Years War against Burma, retaining Manipur its independence in 1826. Military presence on hill inside university campus. 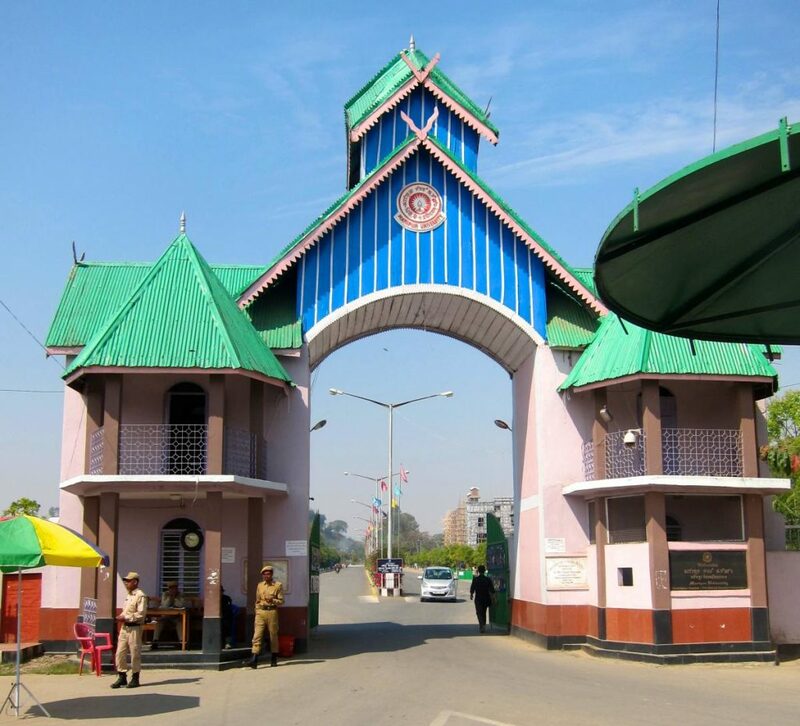 The university is located in a part of Imphal known as Canchipur, which has a special importance since this was the place where the Manipuri kings had their palace. 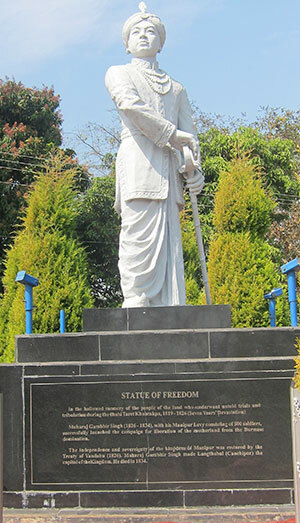 This is no more, only ruins remain, but several statues remind the visitor about the long history of the independent Hindu kingdom of Manipur, that fought wars against the Burmese and then in 1891 was overrun by a British army and integrated into British India even though a marionette king was allowed to stay on as nominal ruler till 1947. 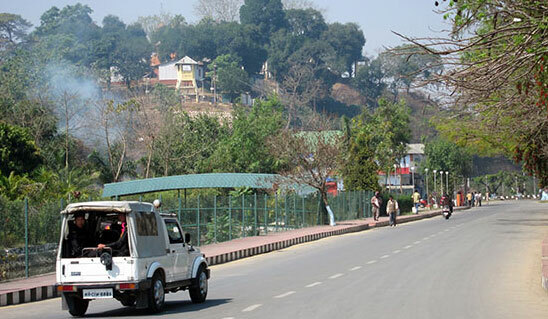 Insurgent groups have later been active in Manipur, fighting against the rule of India, and this has led to a massive militarization of Manipur, with Assam Rifles and other regiments being settled all over the state, still today guarding every mountain top and taking positions at many road crossings. VC Nandakumar Sarma and Lars Eklund. Dr. Khangamcha had kindly organised an extensive programme for my stay, in spite of the fact that my visit coincided with the Holi festival, in Manipuri language entitled Yaoshang and being celebrated during five days. The university has an excellent guest house where I was put up as one of only few guests, and from which the construction of a new building next door could be seen, a building that is supposed to be an International Guest House. 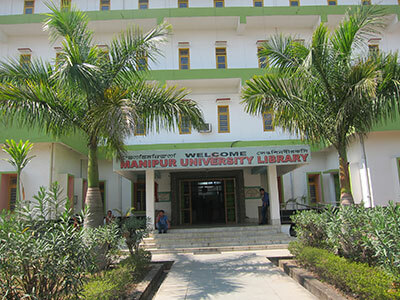 This is a sign proving the ambition that Manipur University is looking for international collaboration to fill up a gap. In the morning of 10th March, the first ordinary day after Holi, a meeting was arranged with the Vice Chancellor Professor Nandakumar Sarma, professor of Physics with a PhD from London. The meeting was also attended by Professor W Vishwanath from the Department of Life Sciences, and of course my host Dr Khangamcha. The Vice Chancellor informed about the history of the university. It was actualy founded as a research centre connected to Jawaharlal Nehru University (JNU) in Delhi in 1972, but was converted into a state university in 1980, and finally declared to be a central university, funded by the Indian governement, in 2005. It has altogether 30 departments plus a number of research centres, and with seven affiliated colleges in Manipur state. The university has established links with a number of Indian universities, in Pune, Lucknow, Delhi and Kolkata (Jadavpur University) to mention a few, but international collaboration is extremely restricted. Prof. Sarma mentioned the collaboration with one university in Thailand, the Surindra Rajabahat University in Amphur Mueang Surin, Changwat Surin, especially in the field of Dance studies since Manipur University is strong in this field with one section focusing on indigenous dance forms, and one on classical Indian dance forms – including of course Manipuri dance. 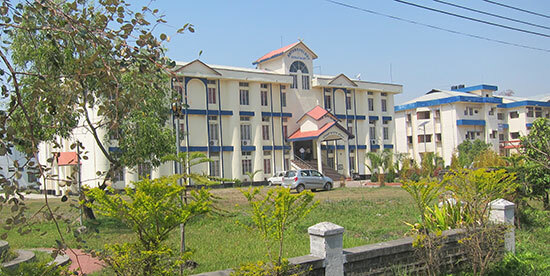 Six PhD candidates from Thailand are currently registered at Manipur University. Another collaboration partner is a a research institute in Mandalay, Myanmar (Burma), focusing on Management studies, but that seems to be all. Of course individual researchers have established contacts with European colleagues and universities, for example Associate Professor Maibam Bidyananda at the Dept. of Earth Sciences who has connections to Germany, and by chance it turns out that Prof. W Wishwanath (photo to the left) is a friend of Swedish researcher Sven Kullander based at the Dept. of Vertebrate Zoology, Swedish Museum of Natural History in Stockholm. Kullander is involved in research on fish in Bangladesh and Burma, and Wishwanath has met him at a number of occasions, most recently at conference in Europe. 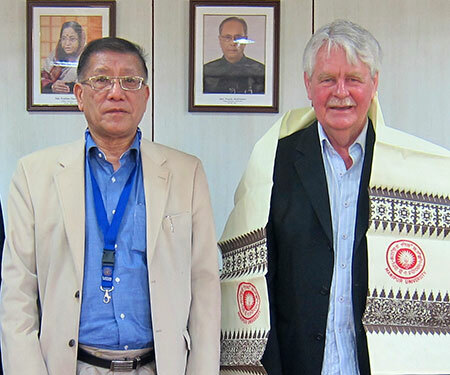 We discussed possible fields of collaboration between Manipur University and Swedish universities, especially SASNET’s home university of Lund. The VC pointed out that strong research fields at Manipur University with a possibility to join up with Swedish researchers are Sociology, Political Science, Linguistics, and Science (Chemistry and other departments). On way from the VC’s office in the main administration building I met a number of students at the well-maintained campus area. 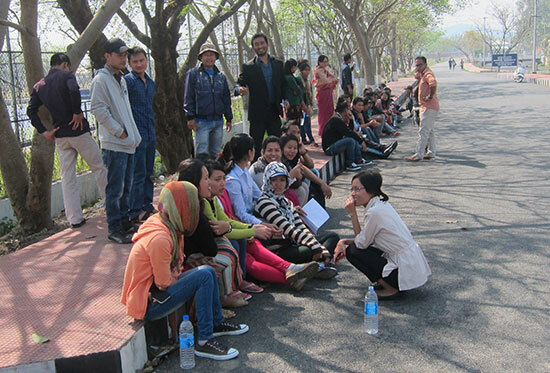 The teachers training students were preparing for a sports event – sports is a prominent feature in Manipuri culture, and a group of management students coming from the university coffee house (photo to the right). 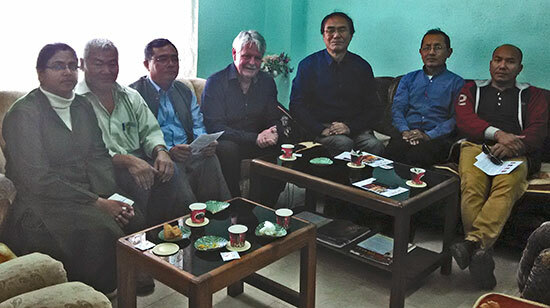 Dr. Khangamcha had called a selected group of faculty members for a meeting with Lars. The meeting was held at Department of Anthropology, located in a charming building in the middle of the campus. It was led by M C Arunkumar, Professor of Anthropology and Director for the Centre for Myanmar and South East Asian Studies + deputy director Centre for Manipuri Studies. • W Nabakumar, Professor of Anthropology, Director for the Centre for South East Asian Studies, and also holding the additional charge of Coordinator, Myanmar Studies at Manipur University. • Laishram Rajen Singh, Reader, Dept. of Political Science, trained at JNU in Delhi. A China expert who has worked on Chinese Diaspora in Southeast Asia, and having spent a year in Yunnan. • Homendra Naorem, Professor, Head of the Department of Chemistry. • Dr. Kanchan Sharma, Dept. of Hindi. • Dr. Milan Khangamcha, Dept. of Philosophy. Meeting with faculty, from left to righ:t Dr. Kanchan Sharma, Dept.of Hindi; Prof. M. C. Arun, Department of Anthropology & Director, Centre for Manipuri Studies; Prof. Homendra Naorem, Head, Department of Chemistry; Lars Eklund, SASNET; Prof.W.Nabakumar Singh, Director, Centre for South East Studies and Coordinator, Centre for Myanmar Studies; Dr. P.Milan Khangamcha, Head, Department of Philosophy; and Dr. L. Rajen Singh, Department of Political Science. After an introduction by Lars on SASNET and possibilities on Indo-Swedish collaboration, including moblity programmes for students, teachers and researchers, MoUs, etc. Prof. Arunkumar presented the university’s interesting Centre for Myanmar and SE Asian studies. Two research associates are connected to the Centre, one from Dept. of History and one from the Dept. of Political Science. The programme is funded by the University Grants Commission (UGC), and includes an MoU with the Yangon Institute of Economics in Myanmar. The Centre is a part of India’s official Look East Policy, to reach out to South East Asia. There are a number of problems however, such as the area of studies that the Myanmarese government accepts in order to give the Indian researchers visa to the country (quite similar to problems European researchers sometimes face when going to India!). It is also necessary to go to Delhi to visit the Embassy of Myanmar, but there are plans to open a Consulate in Imphal for citizens of the northeastern states. The discussion that followed was most frutifrul, and the ambition was clear that Swedish connections is a priority, and special interest was given to the Linnaeus Palme mobility programme. Professor Naorem informed that he already has contacts with Lund University, being friend to Prof. Björn Lindman at the Dept. of Physical Chemistry. He will approach Lindman and suggest collaboration. Likewise, Dr. Laishram Rajen Singh became happy to hear about his Political Science colleagues at Lund University, especially Prof. Catarina Kinnvall, who might be interested in some form of collaboration. Dr. Khangamcha (photo to the left) reacted positively when he heard about Lund University Professor Olle Qvarnström and his Jaina studies, which falls well within the orbit of Dr. Khangamcha’s research. And finally Dr. Kanchan Sharma became interested to get in touch with Uppsala University and its Hindi studies led by Professor Heinz Werner Wessler. A few other academics were supposed to turn up, among them Maibam Bidyananda from Dept. of Earth Science, but he was unfortunately out of station. Besides, noone from the Linguistics Department and the Biotechnology department had been invited, otherwise these two fields are also areas where Swedish researchers might be interested to link up with Manipur. Professor Ch. Yashawanta Singh at the Department of Linguistics is specialized on Tibeto-Burman language group, that Manipuri language belongs to. The department also has other faculty members who have been actively working on various projects on reconstructing grammars of many indigenous languages of the North East India. They have many publications in these fields. Dr. L. Sanjukumar Singh is Head of the Department of Biotechnology. He worked in the USA for about ten years before his joining Manipur University. He is also one of the nine members of the University’s Institutional Ethics Committee (Dr. Khamgacha is also a member of this committee). PS. More photos from the visit to Manipur available as a pdf-file. New International Guest House under construction.